Paul McGuinness has seen the band play live more than anyone else. 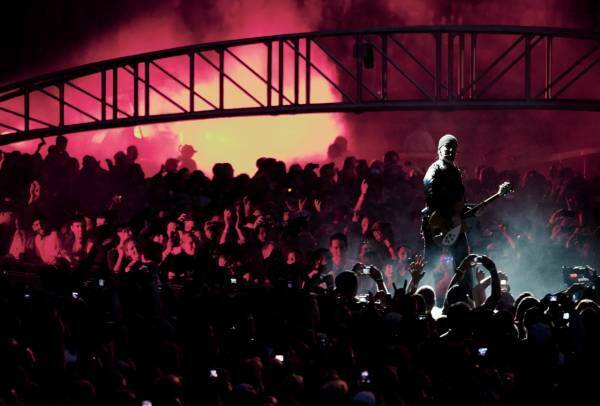 From the most intimate Dublin club in the 1970's to the biggest stages on the planet on U2360°, Paul knows what it takes for a U2 live show to leave the ground ... and what tracks will send it into orbit. No Pride? No With or Without You? The good classics are missing. Guys, listening to the EBTTRT download from the tour, listening to Aak Toong from Q mag, listening to live tracks, listening to EBTTRT on bonus cd of Actung with great base, I close my eyes and it takes me back to Montreal saturday night, what a night, I relive all the time, I want more. Why not a new dvd of this second half of the tour. It was sooooo different to first half and Rose Bowl dvd. Come on guys lets have a dvd, from say Montreal?????? you are right: Even better than the real thing is absolutly necessary to get up in our list of all best live performance songs. Chicago 9-12-09=Bad Nashville 7-2-11= All I want is you Two of the best moments on the tour for me! What HAPPEN TO ALL BECAUSE OF YOU?? OR BREATHE? But no Zooropa??? I agree with an earlier post that called for a double CD. C'mon guys! Love these men and can't wait for more!! I agree with most of the list but I think that zooropa, stay, with or without you and I will follow should also be added. I was at the Rutherford, New Jersey concert and I loved the acoustic version of stay. Great night. Nothing less than U22x2 will do. I have been reading the comments on this regularly since it started and I agree with the many many many members who want a double CD release. I think it is pretty clear that everyone thinks all of the songs should be celebrated. Come on Mr.McGuinness....stop torturing yourself, and us and do it, PLEASE! I guess this was more ore less what I voted for.. I miss magnificent and still doesn't understand why Original of the spieces wasn't on performed on this tour... I've been in 4 concerts and I enjoyed all of them.... U2 Forever! I'm dying to know what songs made the cut for U22 and when I will receive my copy. Can U2.com please update us? Thanks! So much for NLOTH album, it almost vanished from the set list, glad I saw the show early. I believe some readers here are interpreting this track list as THE actual CD. These are the McGuinness' choices for what he would have placed on the CD. Although I disagree with some of his choices myself, I'll be happy to have another great live U2 CD in my collection. This CD needs to reflect songs that separate this tour from the others. So Cruel is for me, the best song. Put it in the list!!! Ive got a bone to pick with Sarajevo, crazy tonight remix; worst arrangement ever, and in a little while. Playlist much stronger with Real Thing, Out of Control, and Zooropa. Maybe even drop Vertigo and Stay for breathe and no line on the horizon. Can't wait to listen to it! Paul is such a great guy, met him on Zooropa tour in Gemany and Austria and he did me a huge favour I will never forget. Great pick with all the tracks. Unfortunaltey we cant fit them all in there, 30 tracks would have been even better than the real thing. I think WOWY, Magnificent, and Electrical Storm should be on the list. I totally disagree with i'll go crazy(remix), it's hard for me to hate a U2 song but this is one song I do hate. That remix was the worst track of the tour. How the heck did it make it on to this CD?